Microsoft executives view their 'benefits wheel' as the hub of their new campaign to get the right benefit to the right partner at the right time. 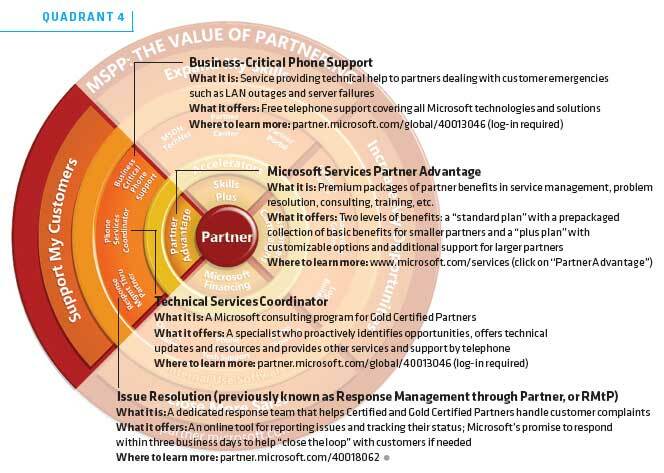 Q: Of all the benefits that the Microsoft Partner Program offers its members, which are the most important? A: Nobody knows for sure. Chances are that even the program's longest-tenured and most plugged-in members aren't aware of every perk to which they're entitled. It's an equally safe bet that many partners don't know which benefits might be most valuable to them -- or exactly when it's best to use them. 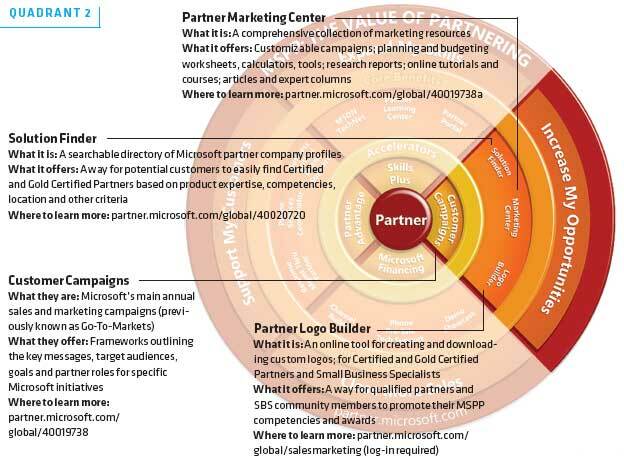 The Microsoft Partner Program's new GM will take a hard look at how the company serves and communicates with its partners. Julie Bennani is both a Microsoft newcomer and an old hand. She's new to her role as GM of the Microsoft Partner Program, the job that brought her into the company in late May. But she's been deeply involved with the company -- and the program -- for years. Previously, Bennani was a partner in the sales and marketing strategy practice at Accenture, the global consulting and outsourcing company. "Microsoft was my premiere client for the last 11 years," says Bennani, adding that for the last six years, she's focused on Microsoft partners. "I've been working with Allison [Watson, Microsoft's channel chief] and her team off and on for the last six years," she says. "And I had a role on the first version of the program as that rolled out" in 2003. "Partners complain constantly that they can't find the right people with the right skill sets," Bennani says. "That need was a compelling reason for me to join Microsoft -- being part of a company that was willing to take a position of citizenship and responsibility in the marketplace. That's why I'm so excited about what we're doing." Setting long-term strategy: "We'll continue to look at how we engage with partners and where we take the program. As part of that, we're working actively with the business groups to design multi-year growth roadmaps." Examining partner benefits delivery: "We want to experiment with the different ways that we serve partners related to benefits." Her biggest question in that regard: Are partners consuming benefits in the ways that they prefer? For instance, Microsoft still provides many partner materials on paper; her team will explore whether most partners would rather receive digital versions. Improving inbound communications for non-managed partners: "One of my charters for this next year is getting some feedback on the number of inbound ways that partners can connect with Microsoft and making sure that those avenues are connected. As partners contact Microsoft through e-mail, by phone or over the Web, we want to unify that experience." Bennani replaced Sherle Webb-Robins, the program's general manager for the previous 18 months; Webb-Robins is now with Microsoft's Enterprise Partner Group. And who can blame them? Even Redmond insiders acknowledge the challenge of staying atop the ever-rising flood of services, support options, technical information, business resources, tools, online communities, learning opportunities, events, special offers, discounts and more. Complicating matters are the buckets of new benefits that appear every year, as well as the existing ones that get refined, revised and, often, renamed. No wonder that partners stepping into that steady stream of goodies may start to feel like they're drinking from a firehose. Microsoft executives won't go as far as saying that the partner program is too bountiful, but they agree that it can be tough to figure out which offerings partners should use when. 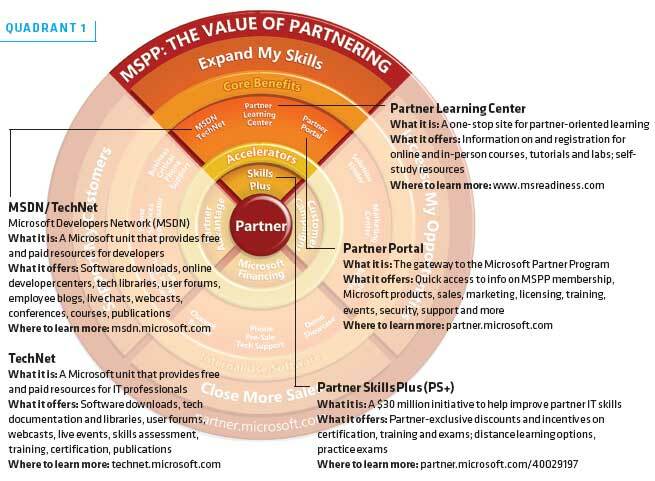 "I think there have been so many features that were built into this thing over time that the complexity might have gotten in the way of what you really wanted the partner to take away," says Brian Madison, general manager of Microsoft Financing, which is among the programs highlighted in the "Right Benefits" initiative. Julie Bennani, the partner program's new general manager, says the plethora of perks simply reflects Microsoft's interest in -- and motivation for -- seeing its partners succeed. "Partners are so critical for our business," says Bennani, a former Accenture consultant who joined the partner program in May (see sidebar, "Introducing Julie Bennani"). "There's an enthusiasm about serving them, and in some cases, that enthusiasm leads to proliferation. It's well-intentioned, of course." She and other executives say the issue is less about the sheer volume of perks than it is about helping partners identify the best ones to help them with this particular situation or at that particular time. 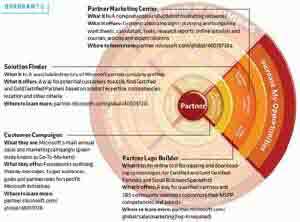 To that end, Microsoft launched its "Right Benefit, Right Partner, Right Time" campaign, which was scheduled to debut in multiple sessions at the Worldwide Partner Conference in Denver in July. 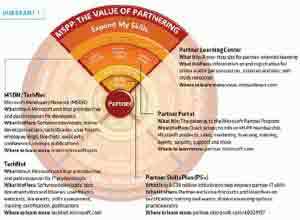 Key to the campaign is a new at-a-glance graphic officially called the Partner Benefits Framework, but colloquially known as the "benefits wheel." 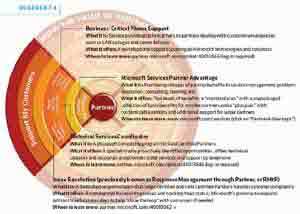 The pie-shaped picture neatly prioritizes, for the first time, the benefits Microsoft considers most critical to partners' business success -- or, as Bennani puts it: "It helps our partners navigate a little bit of the best of Microsoft." That collection is intended to provide "prescriptive guidance" to help partners reach those goals, says Robert Deshaies, vice president of the U.S. Partner Group. 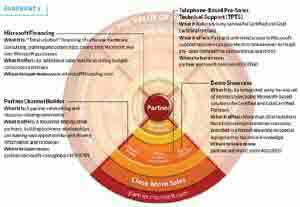 "The benefits wheel clearly outlines the top three most utilized, valued benefits in each of the four sales phases, along with the one key accelerator to help them accelerate that phase," Deshaies explains. (For a peek at Deshaies' own partner program goals, see sidebar, "A Bevy of Benefits for FY '08," below). 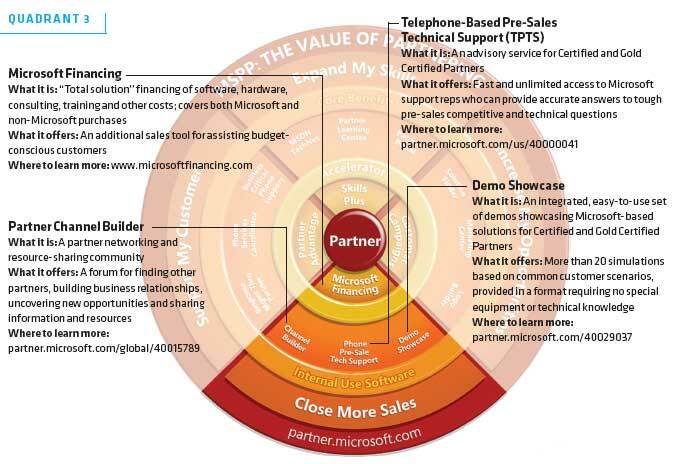 For instance, the "Close More Sales" quadrant of the wheel highlights as key benefits Microsoft's Channel Builder partner-networking forum, its pre-sale telephone coaching service and its user-friendly Demo Showcase, a DVD with scenarios and simulations keyed to customer concerns. The accelerator for the sales phase: Madison's Microsoft Financing, where partners can steer customers for financial assistance for major IT purchases. Microsoft officials say they selected the highlighted benefits based on partner feedback from focus groups and through the company's field organization. The final package is the program's streamlined answer to the underlying question that Bennani sums up as: "If we had to focus on a set of key benefits helping partners to escalate their skills and have a greater business impact, what would those benefits be?" Deshaies cites an even broader objective: "Our ultimate goal is to make Microsoft the easiest company to do business with," he says. "We want to make sure partners are receiving the right level of engagement with Microsoft, and that through these benefits and resources, we're giving them what they need to succeed with customers and grow their businesses more profitably." Robert Deshaies says his U.S. Partner Group will invest in product-launch support, readiness training and new resources. Robert Deshaies, vice president of Microsoft's U.S. Partner Group, has an ambitious agenda for the next 11 months. On Windows Vista and Office 2007: "The launch is not over. We're going to continue to invest and work with partners to drive the value of Vista and Office out in the marketplace, and grow that opportunity for our partners." On upcoming server launches (Windows Server 2008, SQL Server 2008, etc. ): "The server releases will be very significant for us this year, and, again, will create a lot of opportunity for partners in the advanced infrastructure space and in the business intelligence space." On "Ready-to-Go" campaigns, which provide partners with targeted sales and marketing information: "In FY '08, we're going to update and release an additional six campaigns. We'll refresh all seven of the FY '07 campaigns that'll have launched through the end of June. We'll reach over 9 million incremental customers, and 150,000 marketing-qualified prospects." Campaigns being updated include those for Windows Server, SQL 2008, Visual Studio, Unified Communications, Enabling Your Workforce and Enterprise Resource Planning (ERP). On Telephone-Based Pre-Sales Technical Support (TPTS) for Certified and Gold Certified Partners: "We've invested in that in the U.S., and we're going to actually be increasing our investment in FY '08. We've revamped the services based on some learning that we've had ... because we think it's going to help [partners] drive even more success in competitive sales situations in FY '08." On U.S. Partner Group staff: "We'll have an increase in the headcount that services the U.S. partners." On readiness: "In FY '08, just to give you an idea of what we're kind of looking at on the readiness front, we're forecasting in the U.S. to reach over 200,000 partner individuals in training courses across Windows Server, SQL Server, Visual Studio, Forefront and System Center. We're not simply talking about technical content -- we're really looking at [training] across sales, technical, marketing and competitive as we're readying with our partners."